Recruiterflow is a modern ATS that helps recruiters’ source, engage and recruit exceptional talent. Recruiterflow is designed for simplicity and productivity. Any recruiter, irrespective of their level of tech-savvy can easily source candidates, post jobs on various job boards, run email sequences, log candidate and client interaction, input notes, schedule interviews and communicate with candidates easily. Additionally, users can dig deep into their candidate database using the advanced search. They can search not only the resume but also inside the emails and notes shared with the candidate as well. Powerful features of Recruiterflow are the sourcing chrome extension and powerful email and calendar syncing. 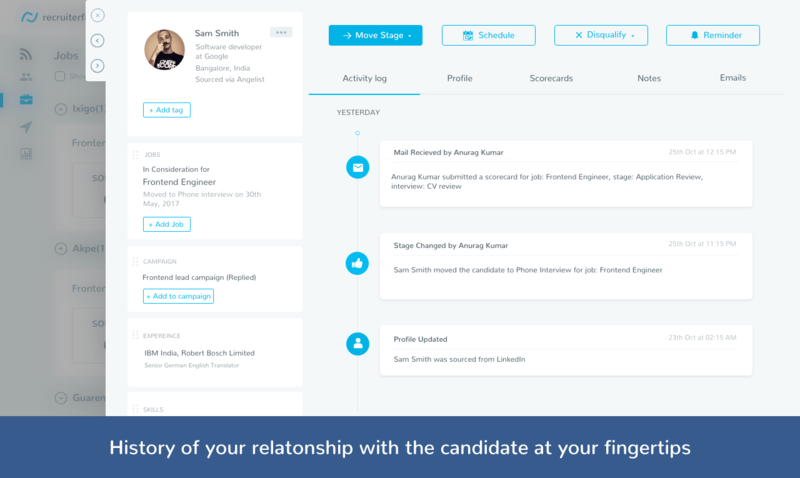 These features allow users to source candidates from major social networks with just one click and no data entry. The chrome extension even helps users find the candidate’s email id and other social profiles. The chrome extension works on LinkedIn, Github, Angellist, Xing, and Stackoverflow. Recruiterflow comes with deep integration with both Gsuite and Office365. It helps our users use email and calendar in any way they like without every worrying about logging data in the ATS. It’s the ATS that lets you do your thing without getting in your way! Still not sure Recruiterflow is right for you? Use our Product Selection Tool to compare other HR Software solutions. Have questions? Call one of our unbiased Technology Advisors for a free consultation. Learn everything you need to know about Recruiterflow. Our experts will reach out to you shortly.